Hearing the words "spring break" might conjure up long days of sunbathing on the beach or vacations that require checked luggage and airline tickets—but it doesn't have to be that way. There are plenty of active (and affordable!) ways to have an unforgettable spring break without traveling too far from home. Check out just a few of the many ways you can have a fun and memorable spring break without too much hassle. Pitch a tent close to home. Spring break is the perfect excuse to bust out the camping gear. 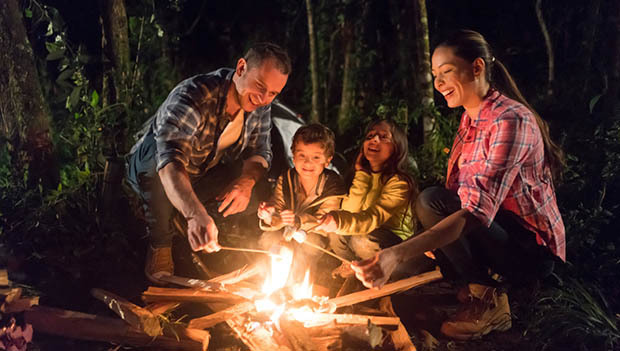 With the days warming up and the nights still cool (perfect for cozying up around the campfire), camping is a great way to get your family outside over spring break. Be aware that if you camp in a local park, the full-service amenities may not be up and running until April. So if your spring break starts in March, check with the park to learn which services will be available. Head out into the backcountry. An overnight backpacking trip is a great way to have an unforgettable spring break experience at an inexpensive price point. Taking a backpacking trip is also a great way to help your kids learn how to read maps, learn basic wilderness survival skills—like how to filter water or build a fire in the backcountry—and teach them a bit about self-sufficiency. If you don't own all of the backpacking gear you'll need for a multi-night trip into the woods, check with your local outdoor store as many offer backpacking equipment rentals. Try your hand at ziplining or a ropes course. There's something about flying dozens of feet above the forest floor that makes ziplining an unforgettable adventure. For a fun spring break treat, take the kids to a nearby adventure park and cruise above the trees on cables. Ropes courses are also exciting opportunities for kids to head outside and get active while also learning to take risks and build confidence. Many adventure parks offer both ziplining and ropes courses, so check the web and weigh your options. Spring is a wonderful time to get out on the river and watch the world come back to life again. And there's no better way to experience the river than with a whitewater rafting adventure. Most areas of the country offer rafting options, from nice and easy class 1 and class 2 rapids to the much more adventurous class 4 and class 5. Trip distance is also quite flexible, with most outfitters offering everything from an afternoon trip down the river to multi-day rafting and camping extravaganzas. Hit your local equine trails on horseback. If your kids find the idea of horseback riding thrilling, why not spend a day of spring break riding your area trails on a guided horseback riding tour? No matter what area of the country you live in, most stables offer a variety of packages that are sure to work well with the needs of your family. From dinner rides that feature fresh-cooked food and live music to rides that make a stop for gem mining, stables these days are putting a fresh twist on the age-old joy of horseback riding. For the wee ones in your family, ask your local stable if pony rides are available. Tour your own hometown—on foot. You don't have to travel hundreds or thousands of miles for a spring break adventure when your own hometown has parks, creeks and fun shops just waiting to be explored. If your family is like most, you've fallen into a routine of visiting the same restaurants, stores and playgrounds. This spring break use your free time to see your hometown with fresh eyes. Make a commitment to pop into the stores that you've never stopped in, or try that hiking trail everyone raves about. To make the most of exploring close to home, strike out on foot. We guarantee you'll discover new nooks and crannies—even in a place you thought you knew so well. Hit the mountains and go skiing or tubing. If your home is at high elevation, there's a good chance your local ski resort is still running full force over spring break. For a fun and adventurous spring break adventure, take the kids out for a day of skiing, snowboarding or tubing. Many ski resorts offer multi-day youth camps or special lift ticket deals over spring break, which will keep the kids occupied and active from sunup until sundown while you enjoy the slopes or relax by the fire in the ski resort lounge. Put on a wetsuit and catch a wave. Sand and surf are surefire bets for a fun and adventurous spring break. If you want to hang 10 with your whole family and live within a few hours of the beach, why not give surfing a try? If you're new to the surfboard, consider signing the family up for a spring break surf camp. These camps usually include all the gear new surfers need, like surfboards and wetsuits, as well as one-on-one instruction that will have your family up on the board and riding the waves in no time.